If you haven't been on a cruise lately, you may have a surprise awaiting when you enter the dining room: A bottle of gooey gel to sanitize your hands. Following outbreaks of gastrointestinal illnesses, particularly the norovirus that spread through cruise ships during the past five years, some cruise lines have dipped into the hand-sanitizing business in a big way. 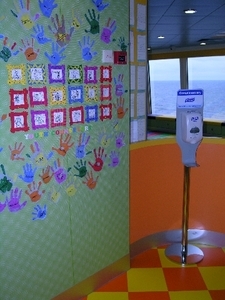 In December, everywhere I turned aboard NCL's new Norwegian Gem, cruising out of New York City, I was greeted with a gel machine for sanitizing my hands -- even at the entrance to the childrens play area, seen at left. In January, aboard Cunard's Queen Victoria, on an inaugural world cruise full of passengers decked out in gowns and dinner jackets, a waiter guarded every dining room, spurting gel into my hands from a plastic bottle of bacteria killer. 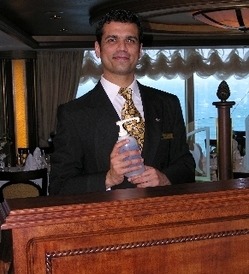 Prasad, maitre d' in Queen Victoria's posh Princess Grill, stands ready, below. Because cruise passengers are confined to a small area, eat together and touch many of the same surfaces, germs spread easily on a ship. These days, cruise lines frequently scrub every surface. To combat germs, especially the norovirus that causes flu-like symptoms for 48 to 72 hours, they have added sneeze bars over the salads and bread on bufets, and they have changed their methods for distributing food, training employees how to keep their germs to themselves. New cruise ship standards seem to be working. The South Florida Sun Sentinel reported this week that serious cases of gastrointestinal illnesses are falling. Federal ship regulators say cruise lines have become the model for fighting outbreaks of norovirus. Capt. Jaret Ames, head of the vessel sanitation program at the U.S. Centers for Disease Control in Atlanta, also credited cruise managers for sending extra medical and cleaning crews to ships with severe outbreaks, and for better informing arriving passengers about outbreaks and keeping them segregated from departing passengers. Unlike nursing homes and hotels, cruise ships are required by law to disclose gastrointestinal illness regardless of cause. Overall, a small fraction of passengers are affected. As I wrote recently in the Los Angeles Times, my guess is that while cruise employees pass on some germs, the primary problem is not the dirty ships but germy passengers. Most ships are cleaner than any other public places you will travel. Alas, the passengers are not. Hand-sanitizers mostly protect passengers from each other. The question is: Does rubbing a hand-sanitizing gel on your palms and fingers do a better job of saving you from norovirus than simply washing your hands? Probably not. At least that's the opinion of Carnival Cruise Lines, which does not use hand sanitizers but has a good record with a minimal amount of norovirus outbreaks. "Strong evidence within the medical community suggests that the gel hand sanitizers don't work against norovirus," said Carnival spokeswoman Jennifer De La Cruz . "So what happens is that rather than washing their hands, people rely on the gel sanitizer, and it provides a false sense of security. We want people to wash their hands. Hand-washing is unquestionably, far and away, the best and most effective method for stemming the spread of norovirus." What can you can do to protect yourself? After you touch door handles, handrails, elevator buttons, other communal surfaces, and especially hand-shaking fellow passengers, don't touch your mouth or nose, or eat with your hands, until after you wash. And wash your hands often. From the Mayo Clinic: Understanding germs. Molyneaux is editor of TravelMavens.net. CLICK for articles on cruising, Florida, Europe and adventure.